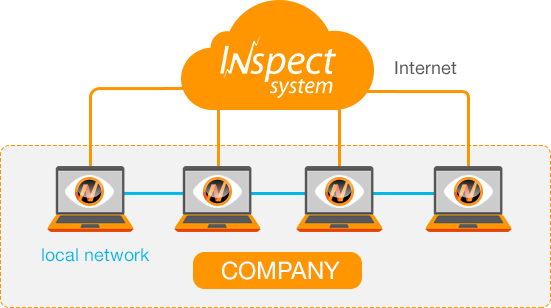 InspectSystem Cloud and Local Solutions: Benefits for Business. The interface and features are the same. Data storage makes the only difference. log in via web browser, supervise online and customize reports. All improvements, new features and updates are applied automatically and free of charge for all users of the service. We maintain the service and assure its functionality online 24/7. All you need to use InspectSystem is a browser connected to internet. To protect agent to server data transmission, the SSL protocol is used. Using SSL hits two important points: strong encryption of the transmitted information and forwarding it to the authorized data server. The data are collected, stored and processed by InspectSystem data center. It is a fault-tolerant system with uninterrupted power supply and reliable technical support. With the Cloud solution it is easy to put your offices in different cities and even countries under online monitoring. All you need to track them all is a client app on each PC, and internet connection. Unlike cloud solutions, you will need to go through several stages in order to start working with the system: technical coordination, commissioning, installation or configuration of the equipment in your office. 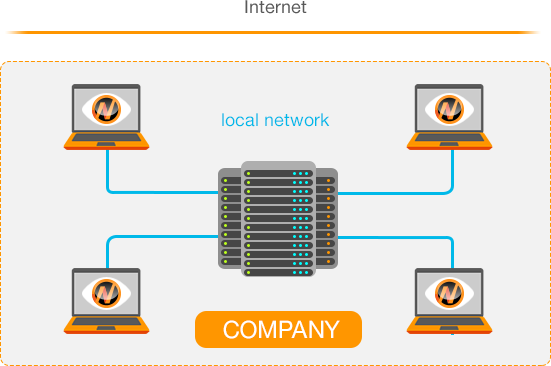 A client to server communication is done through your local network, with no forwarding and no internet connection required. You are the only one who stores and controls your data. Since the system is located within your local network, the software update is carried out manually as per the terms of your license. In the Local version, equipment maintenance is a responsibility of your IT department. Uninterrupted power supply and fault-tolerant server hardware are highly recommended. InspectSystem tech support is available as per the terms of the license.